The red dirt Mana Road runs for over 40 miles heading out towards Mauna Kea volcano, and it’s a great spot for a less trafficked long run with great views. 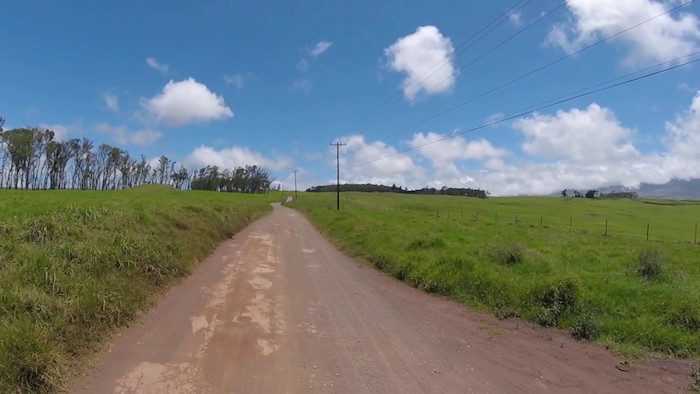 Mana is an old ranch road, which starts off paved just 2 miles east of Waimea, but turns to dirt shortly thereafter. On the way out, heading towards the volcano, the route is a rolling uphill, starting at 2,500 feet. It’s a challenge, but the nice part about the elevation is the weather keeps relatively cool (for Hawaii). Rain is also a possibility at this elevation, but locals say it is mostly the refreshing, misty kind. And when the skies clear, the views are incredible! Do any section of the road you like. It gets but remote the further you go away from Waimea.